Half dog, half man but does graffito have Banksy pedigree? WHAT do you call a dog with the head of a man? Not a Banksy apparently. When this bizarre animal appeared on the wall of a disused London Underground building in Belsize Park, passers-by speculated that the graffiti maestro had struck again. But yesterday (Wednesday) sources close to the secretive artist denied he was responsible. 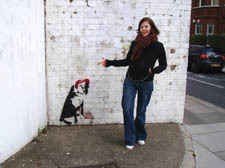 Instead, it appears Banksy has an imitator, who has sparked a debate on how Camden should deal with guerrilla artwork. The “dog-man” – believed to have appeared on the wall some time last week – is just along the road from Banksy’s now-famous maid in Chalk Farm. And it is in Banksy’s favoured medium, the stencil. Conservative environment chief Councillor Mike Greene, a self-confessed Banksy fan, believes graffiti artists with less talent than Banksy should not be allowed to deface property.